It is the final weeks before Mt Hood gets snow. Right now, it is looking about as bare as it can. The square snowfield in the center from this view is up at Timberline Ski Area, which is maintained every month of the year for snow sports -- except October, when it is left to melt before the fresh snow falls. 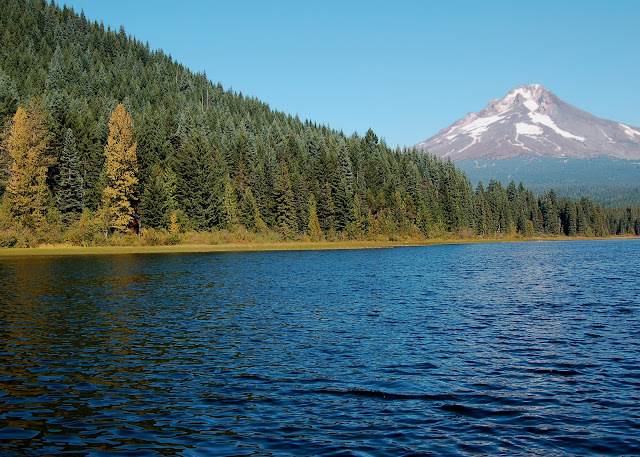 This view is seen from Trillium Lake, where the leaves in the trees are just beginning to yellow. Love all the triangles. Wonderful composition. As I mentioned before, I've never been to any part of the Mt. Hood area....and I've seen photos of Trillium Lake, but this is absolutely beautiful! Yes, I MUST go there someday! Beautiful scene and even better composition!